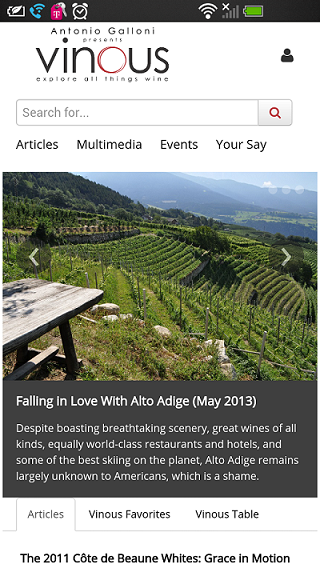 NEW YORK – October 2, 2013 – Wine critic and Vinous Founder Antonio Galloni announced today the launch of the Vinous mobile site for smartphones. “Vinous represents a different approach to exploring wine. Today’s consumers are interested in far more than facts and figures, they’re looking for context, stories and in-depth commentary, all in real-time.” states Galloni. “The new Vinous mobile site offers access to our entire library – nearly 30,000 reviews and hundreds of videos and articles – all optimized for smartphones. We will continue to lead with technology and mobile specifically as we introduce new features over the next year,” said Galloni. “We recognize that global mobile traffic is growing at a record pace and that getting information on the go has never been more important. Our subscribers expect a seamless user experience so we made no compromises in designing the Vinous mobile site. The response has been incredibly positive,” said Co-Founder James Forsyth. “Vinous is our vision of a modern-day wine media platform that places consumers inside the conversation and encourages them to form their own opinions. We bring together professional reviews, the stories behind the wines and the perspectives of our readers in 35 countries using multimedia and leading edge technology. We visit hundreds of wineries each year, allowing us to offer unparalleled, first-hand insight into the world of wine,” adds Galloni. Since going live in May 2013 Vinous has become one the fastest growing wine content websites in the world. Regular features include comprehensive reviews of new releases from Italy, California, Champagne and Burgundy, vertical tastings and retrospectives, in-depth videos shot on location, Vinous Favorites - our top picks under $25.00 - and Vinous Table, where we profile our top eating and drinking destinations. Antonio Galloni’s career as one of the most trusted and respected wine critics in the world spans nearly a decade. In 2004, while a graduate student at MIT, Galloni founded Piedmont Report, the first in-depth, English language journal solely focused on Italian wine. Galloni’s success led him to Robert Parker and The Wine Advocate, where he became the lead critic and covered the wines of California, Italy, Burgundy and Champagne.